Liverpool and England defender Joe Gomez has returned to training following more than three months out of action after breaking his leg. Gomez, 21, fractured his lower leg during the Premier League game at Burnley on 5 December. "It is nice - Joe is not injured any more and nearly fit," said Reds manager Jurgen Klopp. "Joe was out for 15 weeks. That's long, so he needs to now create the basis again for the rest of the season." Gomez, who has won six international caps, has made 18 appearances in all competitions this season for Liverpool, who are top of the Premier League with less than two months of the season remaining. 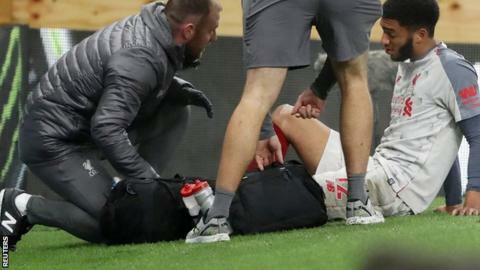 Klopp also said midfielder Alex Oxlade-Chamberlain, yet to feature this season because of a cruciate knee ligament injury sustained last April, could return to training soon. "We're careful of course," added the German. "He is working, he is doing a lot and I think will be in training in a week again. Then he will be fine." Liverpool are next in action on Sunday when they host Tottenham. They then visit Southampton on 5 April before the first leg of their Champions League quarter-final against Porto on 9 April at Anfield.